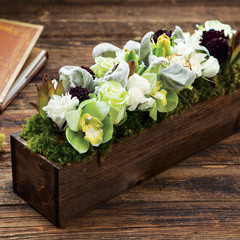 Beauty blooms in an artfully weathered mint green metal potager. 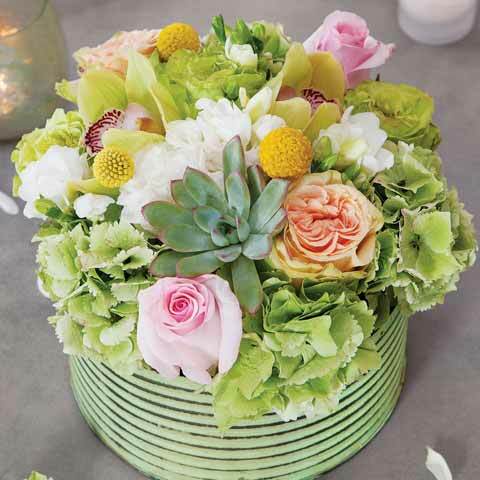 Lushly arranged with a striking succulent and sunny buds accenting a soft vintage inspired palette, Harmony Fleur measures approximately 7 ½" x 8" to top of arrangement. Requires next day shipping. 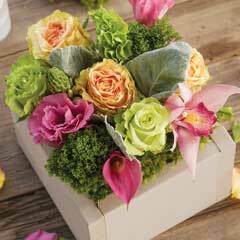 Harmony Fleur is a fresh cut floral arrangement. Harmony Fleur is rated 4.2 out of 5 by 9. 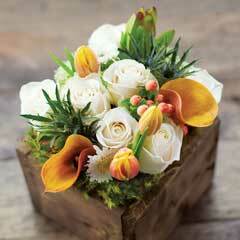 Rated 5 out of 5 by kiki6 from simplistic beauty the flowers were sent to a postoperative patient. she was delighted to have self watering flowers that she did not have to fuss with. Rated 1 out of 5 by e277 from Harmony Fleur I sent this to a friend whose husband passed away. It arrived on a Friday and I saw it the next day at the Celebration of Life service. It was pathetic. The flowers were wilted and the arrangement was not at all attractive. I should have used the local floral shop and would have spent less money for fresher flowers. I will not use your floral service again. Rated 3 out of 5 by LLA 123 from pretty But small I bought this for a friend. When I saw it I was surprised by the size of the arrangement. It was small! The flowers were fresh and beautiful but for the price I thought it would 11/2-2 times larger. Rated 4 out of 5 by Amy75 from Beautiful Except Hydrangeas Sent this as a thank you gift. The container and roses were lovely, but the hydrangeas were dead. Called customer service who went out of their way to make it right - well above my expectations. They really do mean 100% Satisfaction Guaranteed. Have ordered from Olive and Coco several times and definitely would again . Rated 5 out of 5 by AmyA from Beautiful Arrangement I sent this to a friend to let her know I was thinking of her during a difficult time in her life. She loved it and sent me a picture. It was just as beautiful in person as online. Rated 5 out of 5 by Amy J from Stunning! This was a gift so I did not see it for myself but my Mom said it was stunning. I’ve ordered floral arrangements from Olive and Cocoa many times and they’re always a hit. Rated 5 out of 5 by My friends call me JK from Beautiful flower arrangement in a cute container I sent this arrangement to my best friend For her birthday. She absolutely loved it. Rated 5 out of 5 by Zully from Freshest flowers ever!! Delivery on time and perfe Very satisfied with my purchase. Recipients loved both items.